Wiseman Law Firm's foundation is built upon a strong commitment to integrity and professionalism that stems from the confidence that only practical experience and a steady moral compass can provide. 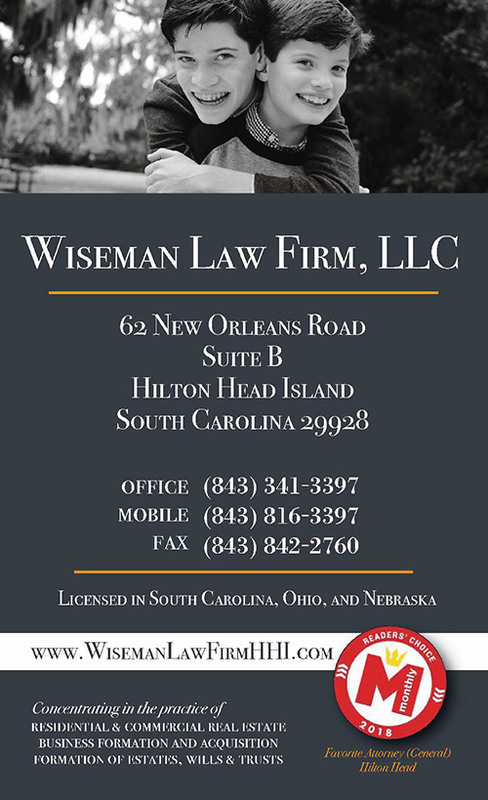 Wiseman Law Firm offers a wide range of legal services involving real estate law including residential and commercial closings on Hilton Head Island and Bluffton, all areas of business law, and comprehensive estate planning. Charles H. Wiseman is admitted in South Carolina, Ohio, and Nebraska. He has been an island resident for over 25 years. Charles H. Wiseman and his legal team offer their clients the benefit of the practical experience required to accomplish real results to fulfill clients’ needs and give them the peace of mind they are seeking when coming to the firm for counsel. At Wiseman Law Firm, working as a team with our clients ensures the significance of your legal issues will not be overlooked. Our collaborative, client-first focus is built upon a tireless work ethic and a genuine concern for the well-being of our clients. The uncommon personal support we extend to each of our clients will help to create customized solutions for all of your individual legal needs. Client relationships are our top priority and we take pride in being readily available whenever your legal needs require immediate attention. We look forward to assisting you as our client and leaving as our friend. Check out our Ad in Hilton Head Monthly! Legal Notice: The information on this website is for general information purposes only. Nothing on this site should be taken as legal advice for any individual case or situation. This information is not intended to create, and receipt or viewing does not constitute, an attorney-client relationship. Please be aware that Wiseman Law Firm cannot guarantee that your communication with the firm by means of this website will remain free from interception by third parties. Nor will the firm necessarily agree to represent you simply because you send the firm an email. No attorney-client relationship is created simply by sending us an email and sending any sensitive information before such a relationship is created is not confidential or privileged.